For me, the holidays are spent in the kitchen. We cook a lot, eat a lot and enjoy spending time together. It's a fun time. The only down-side is cleaning up after we are done. 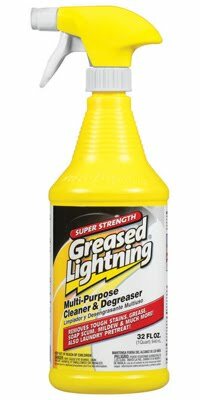 This year I had a new product to help with my cleaning, Greased Lightning Super Strength. I started using the Greased Lightning on my stove-top. Having made bacon for breakfast, I had some splatters all around. The Greased Lightning quickly cut through the mess. With just a couple of squirts, my stove top and back-splash were sparkling clean. Since Greased Lightning is an all-purpose cleaner, I used it to clean-up our guest bathroom too. With one roll of paper towels and this bottle I was able to go from room to room and get all of my cleaning done quickly. Greased Lightning is available at Home Depot, Lowe's, Dollar General, Kroger and Walmart. Disclosure: This review was made possible by Mom Spark Media. Thoughts are my own. For my complete disclosure policy, please see www.more4momsbuck.com/disclosure.